Our hotel is situated in the historical building, erected in 1913 by architect Fomichev for ship owner Prohorov as a profitable house. Small amount of rooms allows us to be attentive to every guest. 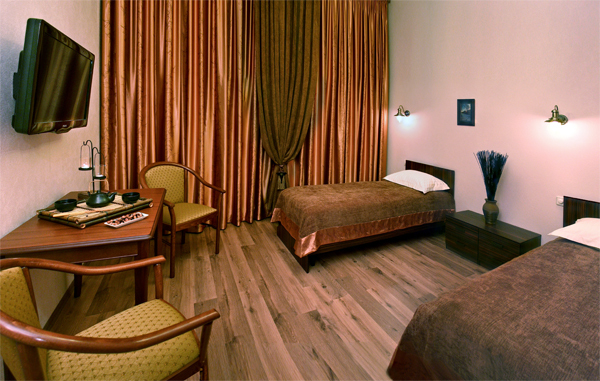 Comfortable location in the center of the city permits to get quickly and easily wherever you want. Twin room with extra bed (2+1), if required (for an extra fee). • Toilet with massaging shower. • Free Wi-Fi Internet access. In case of late check-out less than 8 hours an extra 50% charge of a room per night will be added to your accommodation bill. Late check-out more than 8 hours makes up 100 % of the room cost.